At Berger Bullets, enhancing the rifle shooting experience is our primary objective and founding ideal. Keeping our eyes constantly on this prize impacts every aspect of our operation. Our goal is to establish the most accurate and up-to-date information possible, so trajectory predictions while using Berger Bullets are the most precise performance estimates available. This data will be constantly reviewed and refined annually to maintain the accuracy of this information. Recently, we announced an update to our ballistic coefficient (BC), reference dimensions and twist rate recommendations data. The update to the BC and reference dimensions data is the result of years of testing all the bullets we’ve produced from each lot. The update to the twist rate data was a bit more complicated. We believed that telling a shooter that the 1:10” barrel they’ve been using for years doesn’t work for the bullets they’ve been shooting was going to cause significant confusion and dissatisfaction. To resolve this concern, we had decided to offer two twist rate recommendations. We would offer a Minimum Twist recommendation which allows a bullet to make round holes in targets, but is not fully stable. We would also offer an Optimized Twist recommendation down to the 0.1” so that each shooter knows what twist rate they needed to achieve their level of desired performance. It sounded like a great plan at the time. Turns out, we were wrong. Launching our twist rates in this way has served to provide far more confusion than solutions. The complexity of stability and how it works at different environments is something that can’t be communicated in a few short words and a couple of numbers that suggest two different outcomes. It was clear that we needed to revisit this situation, and fast. Understanding twist requirements is an important consideration in bullet selection. Unfortunately, there can be a great deal of gray area in the calculation of stability since it’s affected by atmospherics and muzzle velocity. 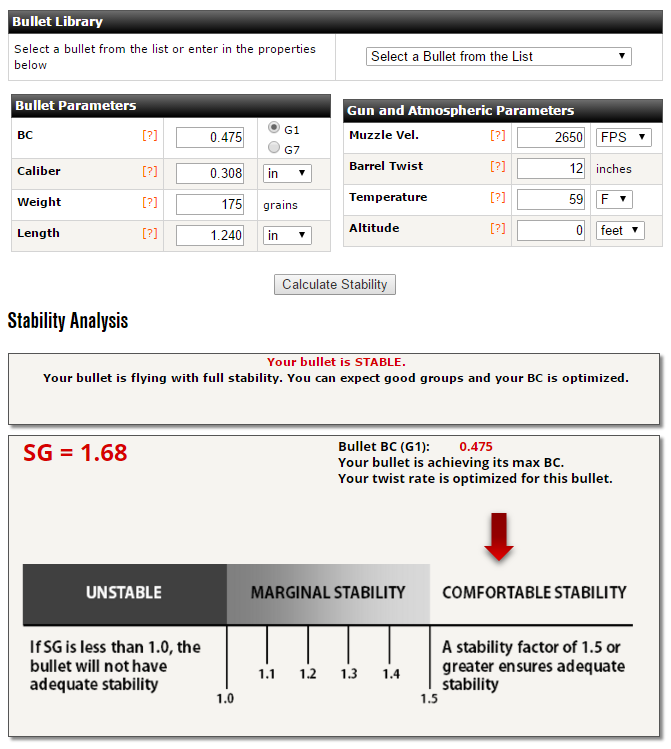 The best way to determine accurate stability requirements for your bullet is to use the Berger Bullets Stability Calculator. This calculator is the best resource for determining twist requirements. In addition to the stability calculator, Berger also offers basic twist recommendations that are based on achieving optimal stability in nominal conditions. This is the twist rate that appears on bullet box labels and brochures. Since stability requirements are so dependent on individual conditions, it’s difficult to provide a one size fits all twist rate for every scenario; so with any single twist recommendation, certain assumptions need to be made. This article describes Berger Bullets’ policy for arriving at recommended Optimal Twist Rates. In order for a bullet to fly with its highest BC possible, the stability factor needs to be 1.5 or higher. Bullets can fly with optimal precision with stability factors less than 1.5, but BC will be somewhat degraded. Regardless what twist rates are recommended, they’re based on assumptions. Berger’s recommended twist rates are based on achieving optimal performance in nominal conditions. This means that the twist rates may appear somewhat conservative. In other words, the Berger recommended twist rates may be faster than what you actually need in your environment. One other thing to understand about the Berger optimal twist rates is that since they’re based on achieving optimal stability and performance, you can use slower twist rates and achieve good accuracy, although you may not be getting all the BC out of them. In addition to basing the twist requirements on full stability, the twist rates are also rounded down to the nearest whole number. For example, consider that for a 6mm 105 grain Hybrid, you need a 1:7.8” twist for optimal performance in standard conditions. Many people have success with this bullet in 1:8” twist because a common application involves high velocity and summer conditions above sea level in which a 1:8” twist actually produces an SG equal or greater than 1.5. Due to Berger’s policy of rounding down to the next fastest twist rate from the optimal 1:7.8”, Berger arrives at a recommended optimal of 1:7”. This is an example of how Berger’s policy for recommending optimal twist rates for all conditions may result in a highly conservative result. To see all of the new twist rate recommendations you can download our Quick Reference Sheet. It is very important to remember that the best resource for understanding your bullet’s actual stability in your conditions is the Berger Stability Calculator. If you need assistance in using this powerful tool, please contact us at support@capstonepg.com.